picture on a black-and-white page. Over the past week, countless debates have erupted and friendships have ended…over the color of a dress. The infamous dress, made by British retailer Roman Originals, first appeared last Wednesday, February 25, when Tumblr user swiked posted the image and asked what colors the dress was: blue and black, or white and gold? The original post has received over 73 million views, including approximately 140,000 views per minute between 10:30 PM and 11:30 PM on Thursday, February 26. 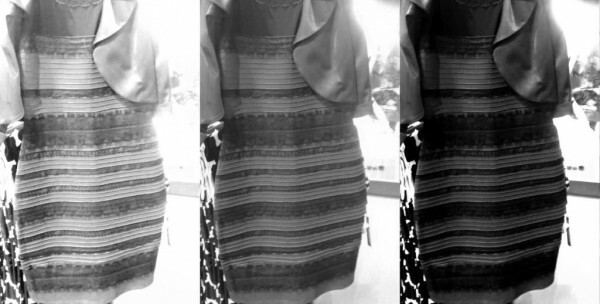 So, what color is the dress, and how can people see it as different colors? Each wavelength of light in the visible spectrum corresponds to a different color. Light rays are reflected off an object and enter the eye through the cornea, which bends or refracts the rays, which then pass through the pupil. The iris opens and closes to regulate the amount of light that can pass into the eye. The light rays then enter through the lens. The light hits the retina in the back of the eye, and electrical impulses are sent via the optic nerve from the eye to the brain, where the signals are translated into images. The brain then determines what color of light is reflecting off of the objects you are viewing. However, the brain perceives colors differently depending on the surroundings. For example, when looking at an object that is in a shadow, the brain will automatically remember that shadows make objects appear darker, and so it will compensate for the lack of light. The surroundings of the dress are somewhat ambiguous due to the lighting of the image, so the brain tends to make assumptions depending on a person’s surroundings in real life, as well as each person’s individual perception. Because each individual’s retinal sensors and brains are slightly different, each person’s perception of color varies. Though color is determined by circumstances, as well as the “eye of the beholder,” the official website of Roman Originals has the dress for sale in several different color schemes — and the one in question happens to be blue and black.